2. EuroPipe is a private enterprise which has been invested in with the highest capital listed so far in Vietnam (Total cost estimated at over 600 billion VND). We can supply HDPE, PP-R, uPVC pipes and pipe fittings with diameter ranging from 20-1200 mm. EuroPipe is now one of the 3 leading enterprises in the plastics pipe market, along with other state-owned or foreign enterprises. 3. All plastic raw materials are directly imported from the most reputation company from UAE, Korea. 4. 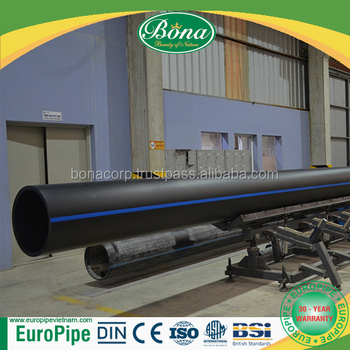 One of plastic pipe factories with the largest pipe diameter in Vietnam up to 1200mm. 5. EuroPipe is the only manufacturer in Vietnam which has a mechanical factory to produce pipes and the accessories molds: This ensures that Euro Green Plastic can produce pipes and accessories corresponding to reach any customer demands. Inheriting nearly 20 years of valuable experience from the AMACCAO Corporation on the production of construction materials,Euro Green Plastic Limited Company (EuroPipe) is proud to be equipped with the newest and most advanced manufacturing machines from Germany. The newest most advanced equipment has been directly imported from Germany. The machines are from Battenfeld-Cincinnati leading technical branch names on pipe and accessories manufacturers in Europe. Employees of EuroPipe Vietnam are trained by German experts for six months before working. The production and management process is director by European managers. The product quality is carefully and strictly complied with International and European manufacturing processes, from selecting the materials to manufacturing products, with special attention to output product quality control. 1. Why choose our product? Yes,we can provide you the free sample, but you need to pay delivery costs. Yes,We can change the form of the packaging and transportation according to your request,but you have to bear their own costs incurred during this period and the spreads.